Motorists faced hours of delays after a lorry carrying chocolate bars was engulfed by flames on the A2 at Bluewater, Kent. 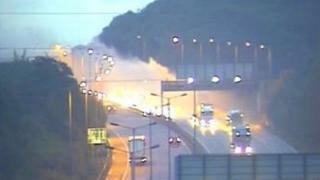 At one point, three of the four London-bound lanes were closed after the lorry and much of its cargo was destroyed. The lorry was carrying 25 tonnes of Lion bars, a Nestle spokeswoman said. A crash between the junctions for Gravesend West and Gravesend Central also added to the congestion throughout the morning. The driver of the lorry was not injured, Nestle said. Firefighters worked throughout the morning removing the remains of the chocolate bars so the vehicle could be moved. Traffic has returned to normal.